Cambridge University Press will release in September Christianity and Family Law: an Introduction, edited by John Witte, Jr. and Gary Hauk. 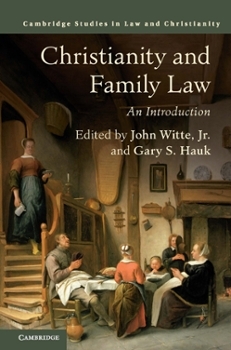 The title is the latest in the Christianity and Law series, which Witte edits. The title introduces readers to the "enduring and evolving Christian norms and teachings on betrothals and weddings; marriage and divorce; women's and children's rights; marital property and inheritance; and human sexuality and intimate relationships...While alert to the hot button issues of sexual liberty today, the contributing authors let the historical figures speak for themselves about what Christianity has and can contribute to the protection and guidance of our most intimate association."